After eight years (I wrote this account in a journal in 2008) many smaller details have been forgotten, but the trip is still fairly vivid. I’m going to chronicle the trip on a day-by-day basis. We planned a 5 day/4 night trip. We would leave on a Monday and wanted to be back by Friday evening for a special church service with an ensemble from Pensacola Christian College. 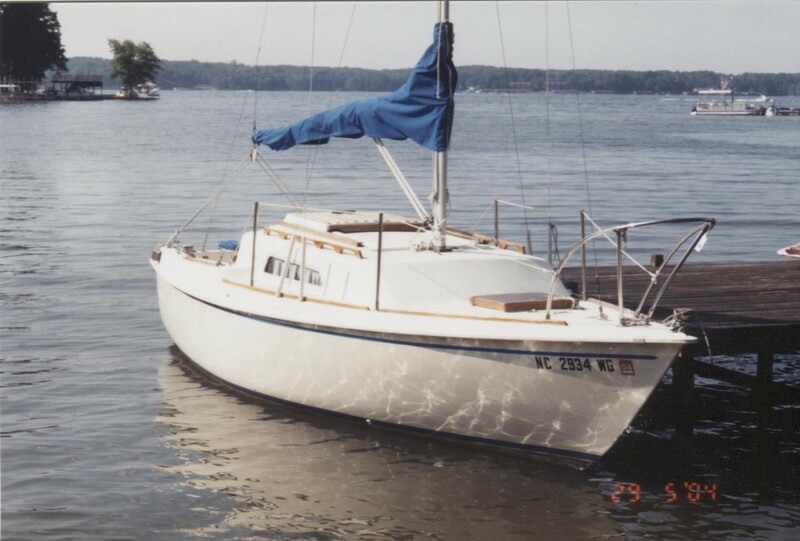 I don’t remember ever sailing Flying Lady, our Kells 23, on any body of water other than Lake Gaston, except our vacation on the Chesapeake Bay (I did have her on Roanoke Rapids Lake once but that was only to reposition her on the trailer). 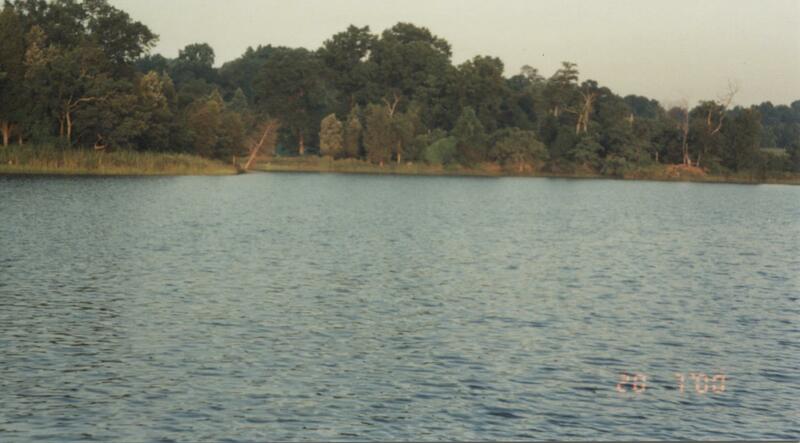 The Chesapeake Bay trip has provided us with a lot of memories over the years, memories which span the spectrum. It all began when I learned of a tall ships parade that was to take place in the summer of 2000 in honor of the arrival of the new millennium. I thought it would be a great experience to be on the Bay as these majestic ships sailed up its waters. The parade was to take place in June. As events would have it, Tara was involved in a serious head-on collision on June 3 and took a severe blow to her right femur. 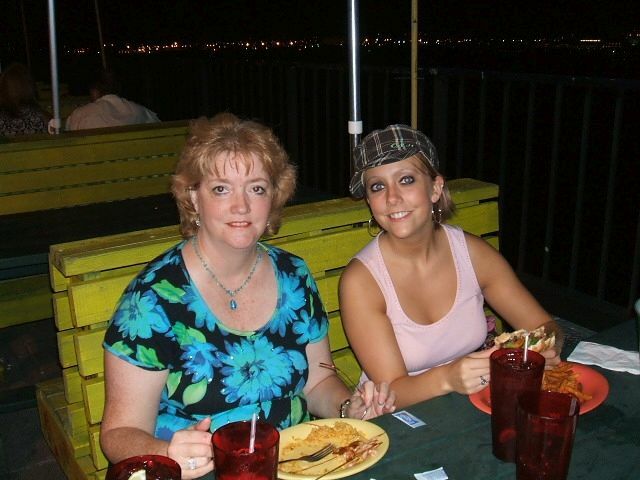 She was in Maryland at the time and was airlifted by medivac helicopter to the famous Shock Trauma unit in Baltimore. Though she had no broken bones the bruise was debilitating, at least for a time. Tara was on crutches and would be unable to sail. We delayed the trip for several weeks (and consequently missed the tall ships). We left in the morning. Our trip to Deale, MD would take several hours. Deale is roughly due east of Washington D.C. and about 20 miles south of Annapolis, MD. I had researched the Bay using the Chesapeake Bay Guide and felt this was a good destination. 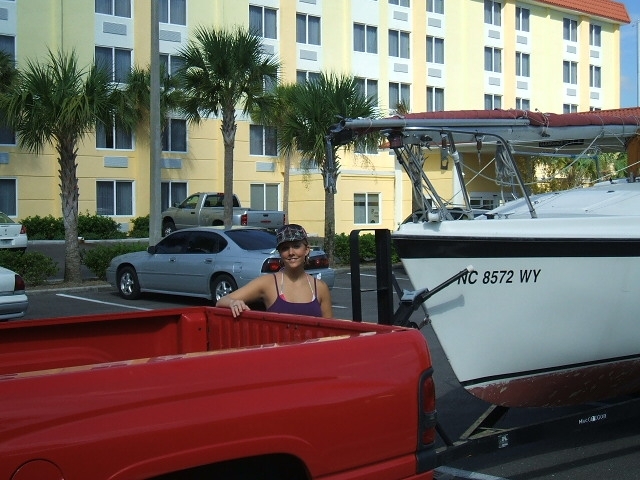 I had found a marina that would allow us to park our tow vehicle and trailer for the duration of our stay. Tommy Daughtry loaned us his 2-door, red, Chevy Blazer which was a great blessing. After much planning, it was quite exhilarating to finally be on the road for my first “big-water” sailing adventure. Excitement was tempered by caution though, and maybe even some trepidation. With absolutely no-zero-nada big water experience I was a bit nervous. I’d tried to do my homework and had studied charts, guides, chart plotting, etc. My skills (or lack thereof) were about to be put to the test, and the test was going to begin sooner than I imagined. After only one hour of driving, as we were going around Petersburg, VA on I-295, something bright caught my attention in my right side-view mirror. Almost simultaneously I glimpsed something out of the corner of my left eye – a wheel zipping down the interstate past me! The bright-something was my axle throwing up sparks and the wheel was mine!! I’d lost a wheel off my double-axle trailer. I knew better than that. I knew wheels needed grease but had neglected to check. At that time I didn’t have bearing buddies (needless to say I do now), so it wasn’t the easiest thing to do; but it turned out to be a costly mistake. I immediately pulled off the interstate onto the shoulder. It just so happened that we were on the overpass of US 460. My wheel had bumped the passenger-side door of a car being driven by a twenty-something African-American military guy who was driving one of his family’s cars. He was very nice and understanding. Thankfully no one was hurt. 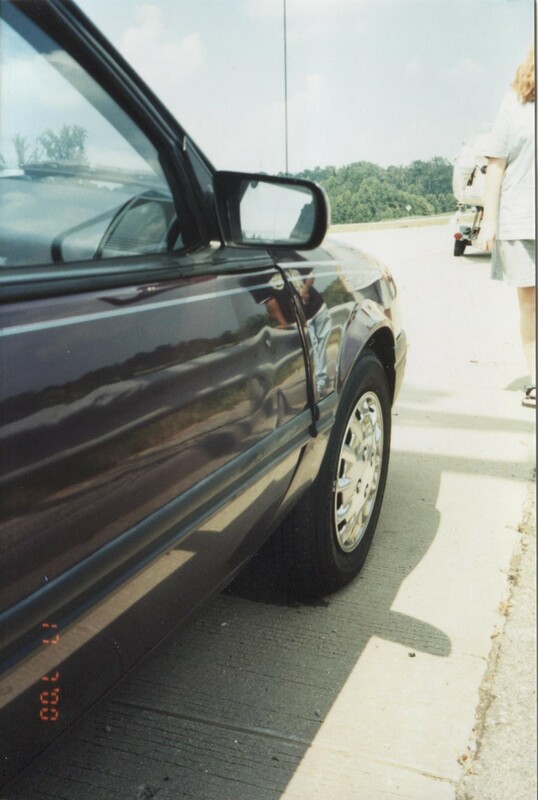 I’m certainly glad we were on a divided highway and not some two-lane road where that wheel could have hit oncoming traffic and done some serious damage (to both body and vehicle). Well, there we were on the interstate with a broken-down trailer. I disconnected the trailer and headed toward town. I stopped at a muffler shop and they recommended a guy who specialized in 4x4’s. 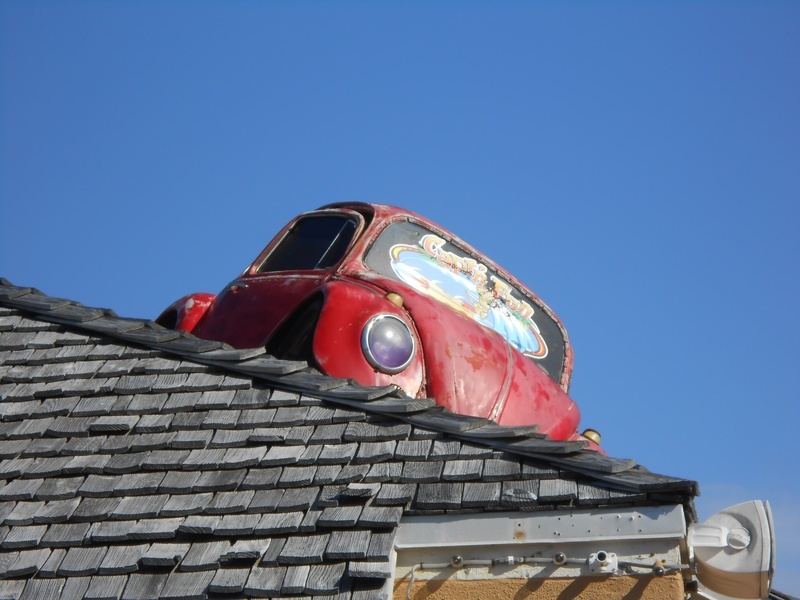 We tracked him down and he agreed to fix it; but we’d have to wait for him to get off from his day job. 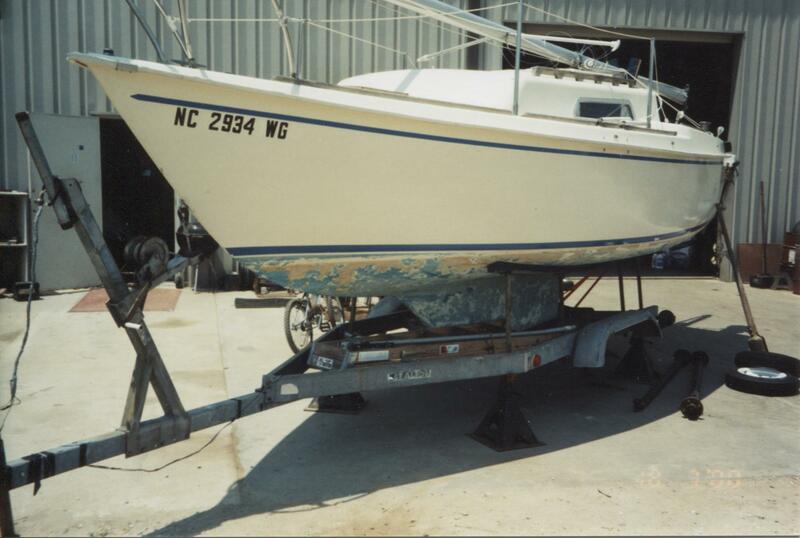 Now the big question: will a 23’ boat on a trailer fit on a rollback? Yep – quit a sight! After our first night on the boat we awoke to cloudy skies and windy conditions. A nor-easter was blowing in. We decided to head out and try it for a while. As we motored through the channel I was trying to be careful. I sure didn’t want to make any more mistakes on this trip. I kept the buoys right in sight. What I failed to account for was windage (my inexperience was telling). Suddenly, I felt us hit the soft bottom. Hey, what’s going on here? 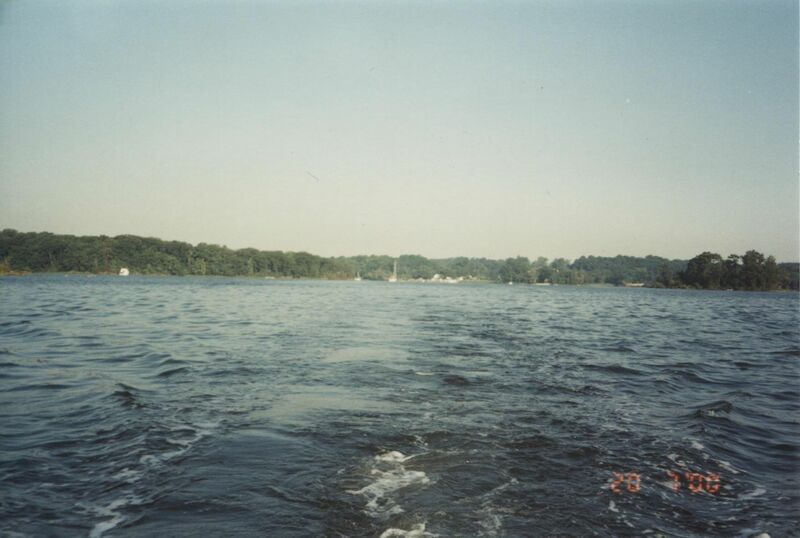 I quickly threw the motor into reverse, got out the boat hook to push a little and we were back into the channel. Close call! All I needed was a grounding with a storm blowing in. When we got out into the open water we had 3-4’ waves which were coming in rapid succession. We didn’t even raise the sails. It would have been absolutely foolish to attempt that with our level of experience and the weather conditions. We returned to the marina. We decided to find some crabs. 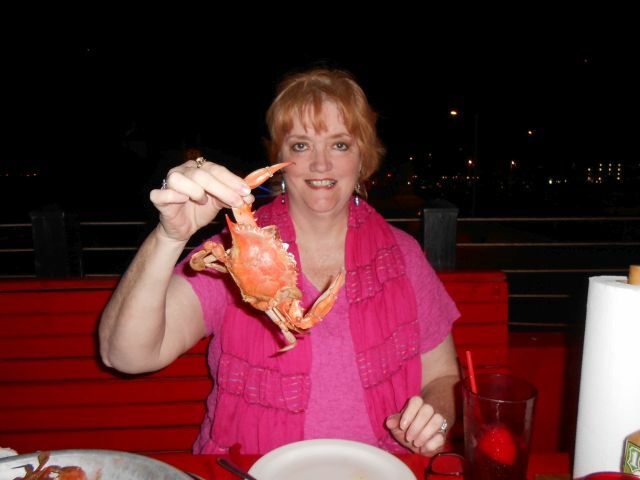 After a few phone calls (from a phone booth) we drove about 20 miles to Chesapeake Beach and enjoyed a $20 all-you-can-eat crab feast: truly a special treat for us after having lived in Maryland for almost 18 years and learning to love steamed crabs. But the night was young… before we could get out of the restaurant Robin started feeling sick. By this time it was raining “cats and dogs”. We got soaked just getting into the Blazer. Very quickly we realized that Robin needed a bathroom and the faster the better. The problem was that we were in the country. Nothing around. Finally we found a convenience store. No public restrooms! A hedge-row and an umbrella would have to do. Poor girl. She spent most of the night in the marina bath house. Some vacation. By morning she was better. The rain had stopped so we headed out into the bay. Waves were 2-3’. We hoisted the sails and were finally sailing on the Chesapeake Bay! We sailed for a while and Tiffany had a blast with her feet hanging over the bow riding that bucking bronco. 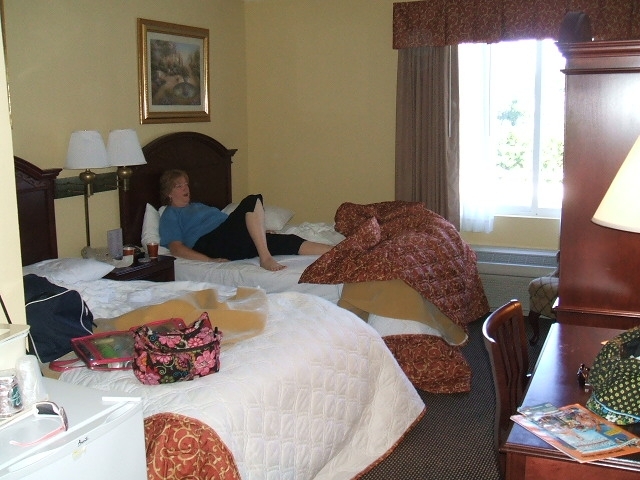 I tried to triangulate our position with Tara’s help (this was before GPS). 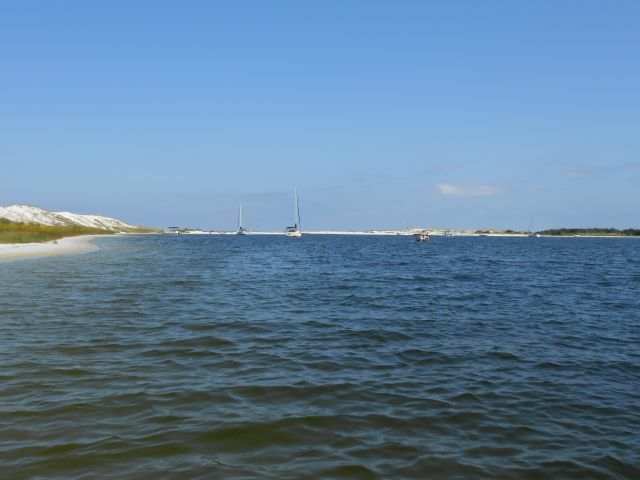 When you’re on big water the shoreline looks like… well, shoreline. It’s hard to make out any distinctive features. Tara got a bit seasick. I was uncertain whether the storm was past and what kind of headway we could make towards the West River where I hoped to anchor for a night; so I headed back in. We ate lunch and took a nap. The skies cleared and the wind subsided. I decided we could safely head up the bay. We motored on water almost as smooth as glass. I was constantly concerned about grounding or hitting under water objects. The chart showed lots of underwater trees. 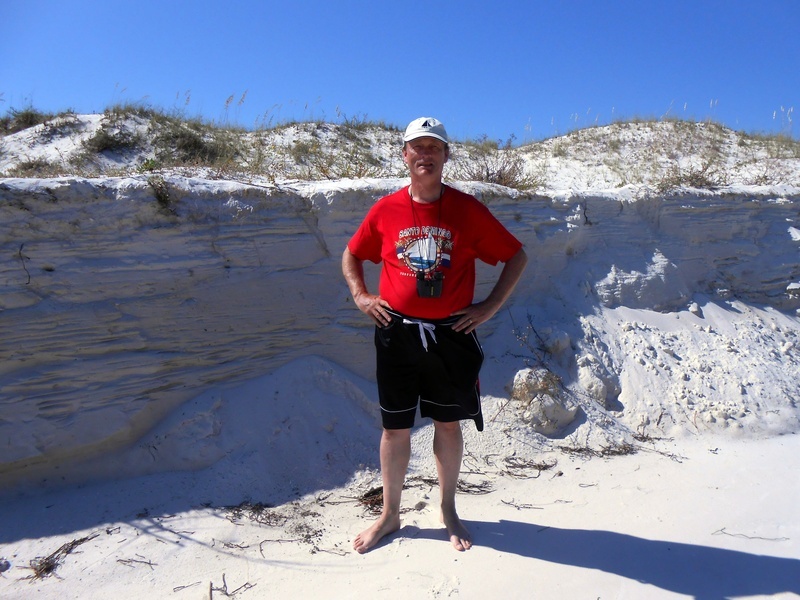 I was unsure as to how far offshore I was – one, two miles? It was otherwise pleasant motoring for a few hours. When we made it to the West River I tried to be especially careful to follow all the channel markers and buoys. That fear of grounding just wouldn’t go away. 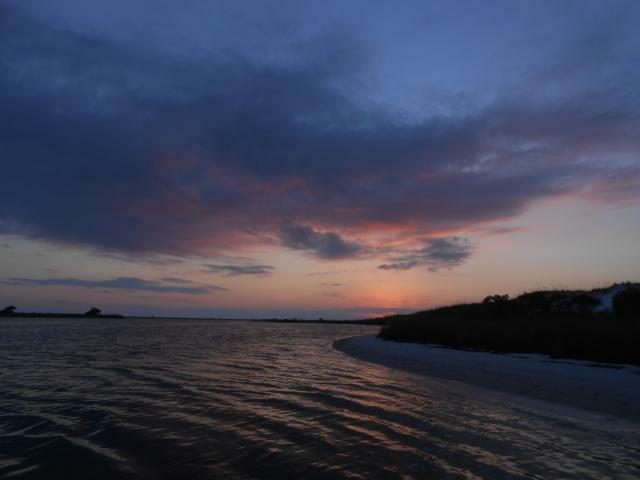 We motored up the West River, turned north on the Rhode River and anchored in a peaceful cove on Fox Creek behind three islands. We enjoyed a nice supper and peaceful evening in the cove. We decided not to swim. We awoke to a beautiful day. In fact, there was a deer grazing on the shore. We had breakfast and began the trip back. On the way out of the river we passed a large, black-hulled sailing yacht anchored off to our starboard. I’d like to have motored closer to get a better look but we needed to make some time getting back. can you see the deer? The trip back was actually quicker. Guess maybe we had some current helping us. One neat thing happened on the way back. We had a small, cheap portable radio we were listening to though it wasn’t picking up a whole lot. We did hear George Jones as clear as a bell sing “He Stopped Loving Her Today”. Man, what a tear-jerker. Don’t think any of us but Robin knew the song well and out there on the water the lyrics just hit us. A memory made. About three miles out the wind picked up; and we were able to sail the rest of the way. In fact, we sailed around just a bit because it was just so nice out. Our time ran out though and we had to head in. Takeout turned out to be horrible. 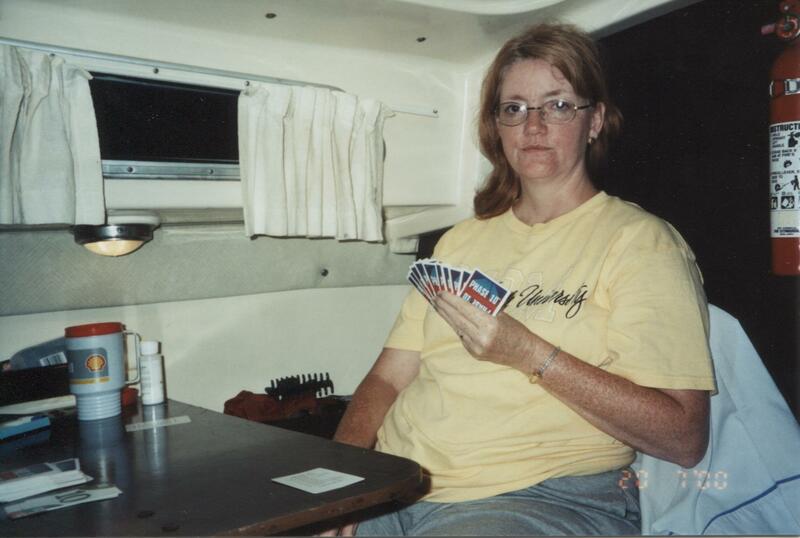 Takeout was always aggravating with the Kells (a problem I failed to solve until just before I sold the boat). 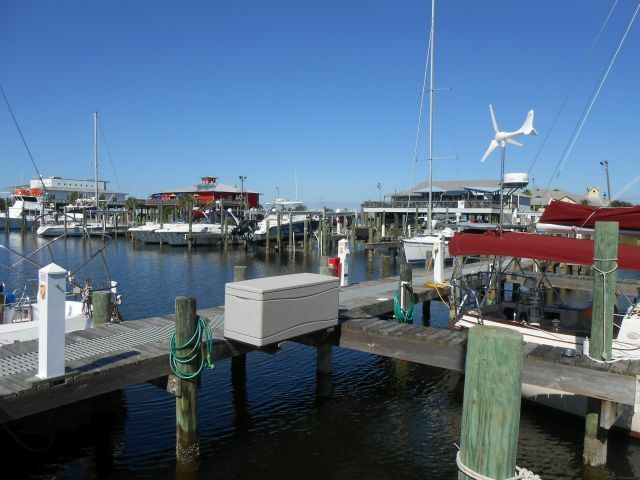 The winch post was always in the way due to the angle of the boat ramps, and it was even worse with the marina ramp which was steeper than most. We wound up cutting the winch post off above the winch, hauling the boat, and then “splicing” the post back together with a piece of 2x4. To our good fortune there were contractors on site doing work on one of the marina buildings who helped us with tools and a piece of lumber. It was hot, we were frustrated; but, finally, we were able to get the job done. The trip back to Roanoke Rapids was uneventful, and we made it in time for the special service. 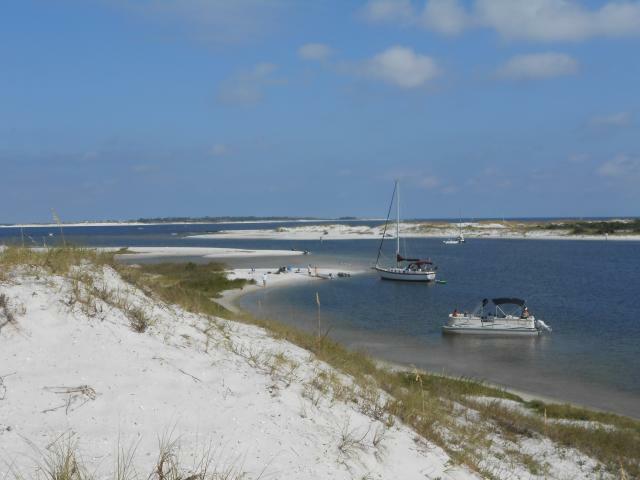 We've known about the wonderful sailing around Pensacola for many years, so this has been a targeted destination for a long time. Here's an account of the trip as posted on the TSBB shortly after returning (with a few modifications). I have only sailed on "big" water twice previously (a 3 day cruise on the Chesapeake Bay in 2000 and a 3 day cruise on Tampa Bay/St. Joseph Sound in 2007) which means these trips are a big deal to us. Both of the earlier trips were not without incident so I was trying to plan a trip that would be as comfortable, safe and stress free as possible. 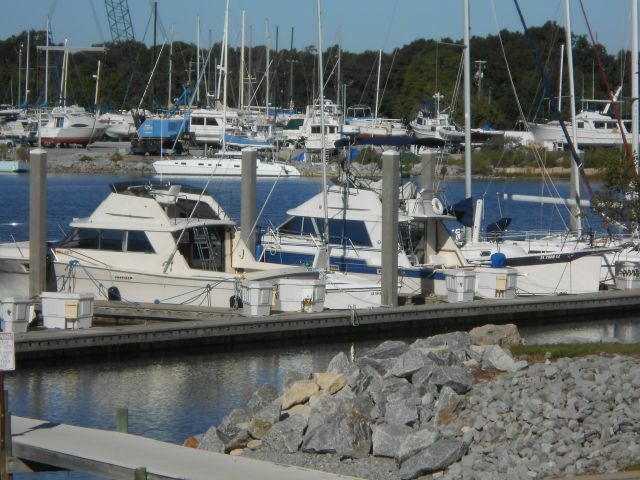 I decided to begin and end at Pensacola Marine Shipyard, sail to Pensacola Beach, to sailboat cove, and return. Prep began weeks ago: cleaning the boat, going through boat stuff, a shakedown overnight on the boat, etc. I re-installed the boat's life lines, bought a new battery, installed a ss ladder, added a 12-volt plug, bought a battery operated lantern as an anchor light, bought a couple extra pins and rings, doubled checked ground tackle, etc. Prep also included coming up with an itinerary, making reservations at marinas, and getting advice from board members. Pensacola Tom and Gregg were especially helpful. Thanks to all who chipped in advice and suggestions. I also went online and downloaded charts of pertinent areas (NOAA chart 11383) and entered waypoints on my GPS using mapserver.mytopo.com/. I print the charts off on regular paper and insert them into place sheet holders and then into a plastic binder. (You can see the binder in one of the pics below. The black cord is to my yellow Etrex GPS.) I particularly was interested in 3 waypoints: the entrance to Bayou Chico, the Fair Point marker, and the entrance to the ICW by Sand Island. The last bit of prep went into scheduling the trip. As it turned out, Karen disrupted those plans but I wasn't about to drive 400 miles into a tropical storm. As it turned out, she blew out, we shifted our days back a little and wound up missing the weekend crowds. We packed everything heavy in the back of the SUV since our load on the trailer tires is right at max. After final loading Monday morning we left Dalton around 9:30 a.m. EDT. 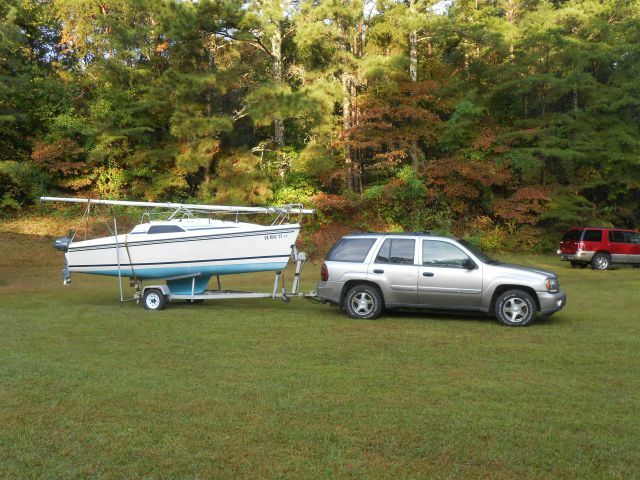 The boat tows well behind the Trailblazer. We took the eastern route through (really around Atlanta) and met our daughter for lunch just south of Atlanta. Always great seeing her and especially the little grandson. After a brief visit, we were back on the road. I was hoping to make it to Montgomery before having to gas up but the horses were particularly thirsty. Turns out I was only getting 13 mpg when I was hoping for 15 or 16. After gassing up at a "dive" we were back at it. 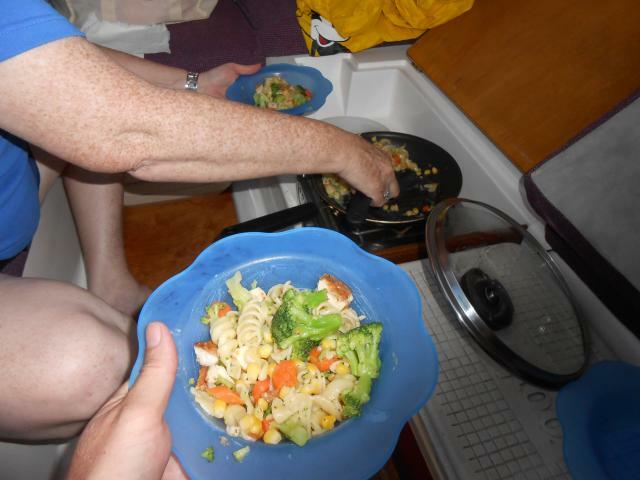 We came prepared to cook supper on the boat that night but since it was a little later than we anticipated we decided to eat supper once we got to Pensacola. 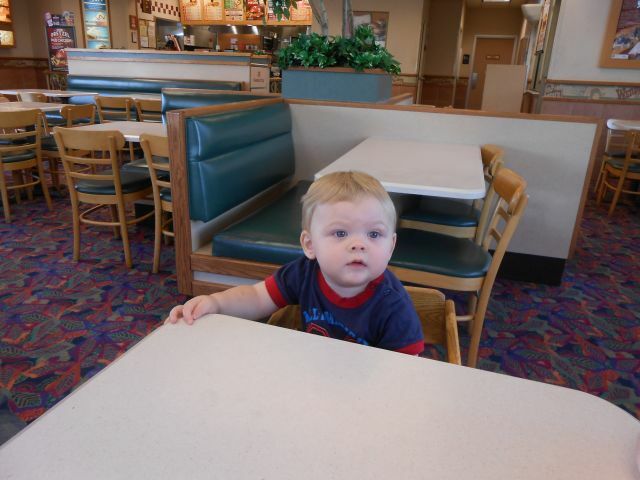 We stopped at KFC on Nine Mile Road and had a wonderful supper. Best KFC I have ever eaten at - a very tasty buffet. Their cabbage was especially good. We found the marina with no trouble, rigged the boat and got her into slip C-28, four down from Shane "Wallace the Great" (a famous TSBBer) just as it was turning dark. The night was peaceful though a bit chilly. I didn't pack a blanket but after a while wound up using a large beach towel which helped me sleep fairly comfortably. I was hoping they would have shore power for regular 3 pronged extension cords but the outlet was dead and I knew the next marina did not have the household type outlet. Just in case, I had bought a GFI to be safe. I ended up buying a 30 amp adapter at the store. Didn't want to but now I'll always have it. The battery being new had plenty of power for one cabin light but we had taken a laptop and a few DVDs in case we wanted to watch something. We never did. The day dawned bright and sunny. Forecast was for light winds and warm temps. This was going to be great! After a simple breakfast on the boat and some complimentary coffee for my wife from the ship's store we threw off the lines and headed out. It was a short 2 miles through the bayou to the end of the channel. We were on the bay! I hoisted the sails and shut the motor down. We were sailing. We headed ESE in the direction of the Fair Point marker. 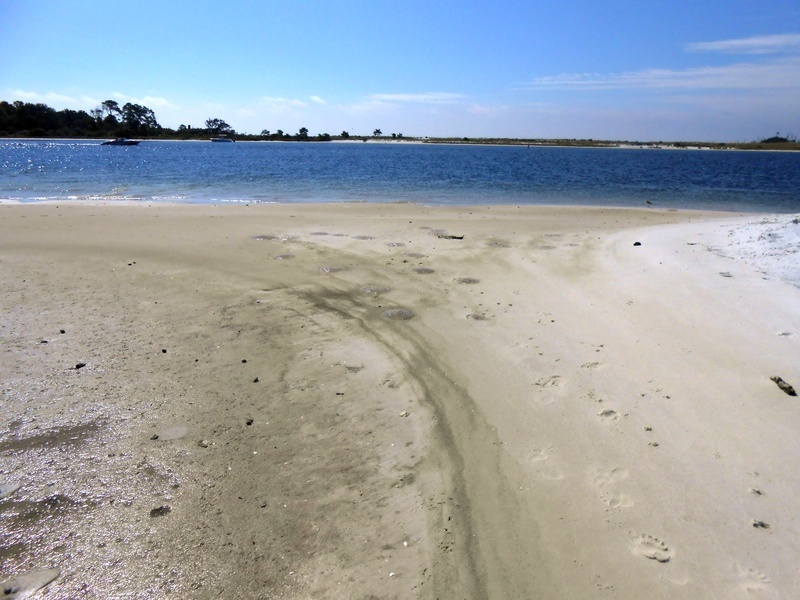 I wanted to get around it before turning SE toward Santa Rosa Sound. We were only making 1-2 knots, occasionally it would bump 3. At one point I even turned the motor back on. Along the way we ate sandwiches for lunch. Robin did a great job packing food for the trip. 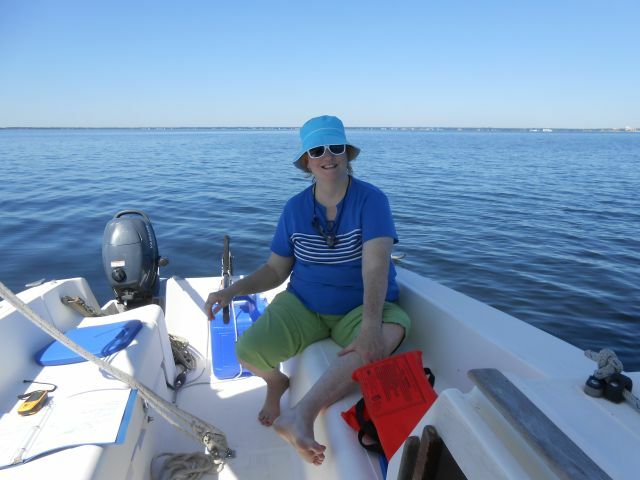 Here's my wife at the helm on the bay. As you can see, the waters are pretty flat. Not as nice a PSM but adequate. My one big complaint would be that the little fingers are not very steady. Was a bit of a challenge for my wife. 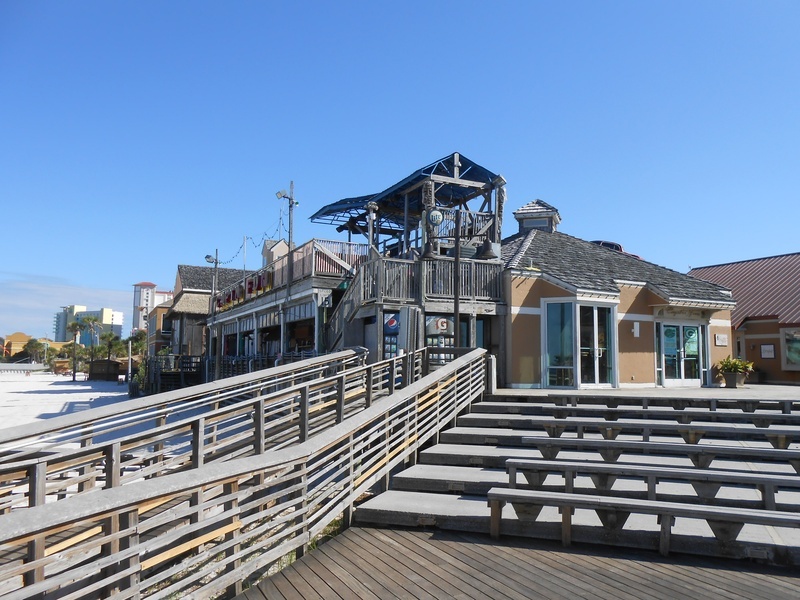 The big plus: the boardwalk was right across the street! We decided to hit the boardwalk for the afternoon, come back at dusk, shower and go back for supper. We worked our plan. It was Tuesday so the boardwalk was not crowded at all. In fact, some of the shops were not open, but we enjoyed the peace. We strolled around, got something to drink, shopped a little, and scoped out some restaurants for supper. I had originally planned to eat at Flounders, since we had heard so much talk about it on the forum; but we decided on Crabs on the Gulf side. Turned out to be a good choice. After an evening stroll we returned to the boat. The wind blew all night and our boat bounced from piling to piling. Not uncomfortable, just annoying. Maybe our lines were too loose? But I didn't want them too tight either with the tides. ??? The third day broke windy and overcast. I went out and bought some ice (the ice machine at the marina was out of order so I had to lug it from the Circle K), newspaper and coffee. The forecast was 5% chance of rain. The marine station was not forecasting anything foreboding either. After a leisure morning and breakfast, we decided to head out, though my wife was a bit reluctant. The wind seemed to be fading a bit. 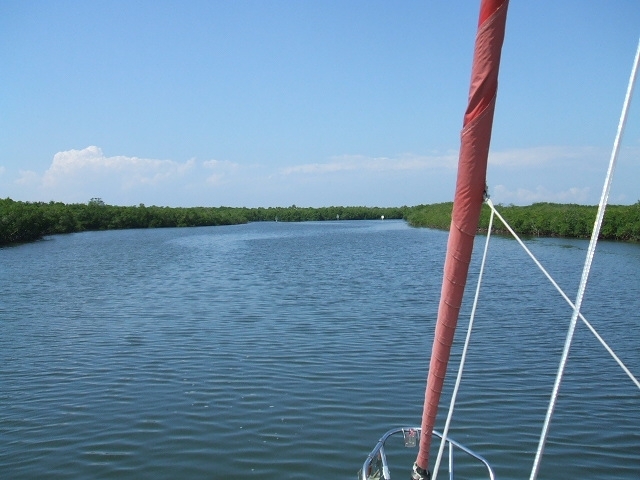 It was from the east and we were headed west so I figured we'd be ok. We got to the end of the channel, hoisted sail and set a course for the ICW channel at Sand Island. We were moving along at a pretty good clip - the GPS was hitting 5 and 6 knots. We were on a broad reach very close to a run. If I had had a pole, I would have set the sails wing and wing, but I tried to stay on a course that would keep the headsail out of the shadow of the main. This pic was taken not long after heading out. You can see the Pensacola Beach bridge in the background as well as the clouds and the sea state. It was great. After a while the wind picked up just a bit and a few whitecaps started forming. Then it happened! Out of nowhere along come these huge 4-5' waves!! Now that's huge to someone not used to them in an 18' boat. And they were coming abeam from starboard. The boat was rocking side to side and I could just envision rolling starboard and taking a wave into the cockpit. My wife was really scared and one wave really got me concerned. I told her to grab the portable radio off the cabin bulkhead just in case. Truthfully, I didn't know exactly what I should do. I didn't want to turn back into the wind. What I really needed to do was to set a course to take those waves at an angle; but I was afraid a gybe would be dangerous and heading up to starboard would put me on the wrong course. So I just kept plowing forward and watching. The "terror" lasted 10, maybe 15, minutes at the most and just as quickly as the waves appeared they disappeared. In hindsight, I believe that the waves were the result of the collision of the waters from the Bay and the waters from the Sound. The tide was going out and the wind was out of the east pushing more water into the mix. When we arrived back at PSM, one of the guys at the store said that it can get churned up like a washing machine out there. If I ever go back, I'll certainly be on alert to similar conditions. Thankfully, we made it through. In the following picture which was taken shortly after that episode you can see the sea is fairly calm. 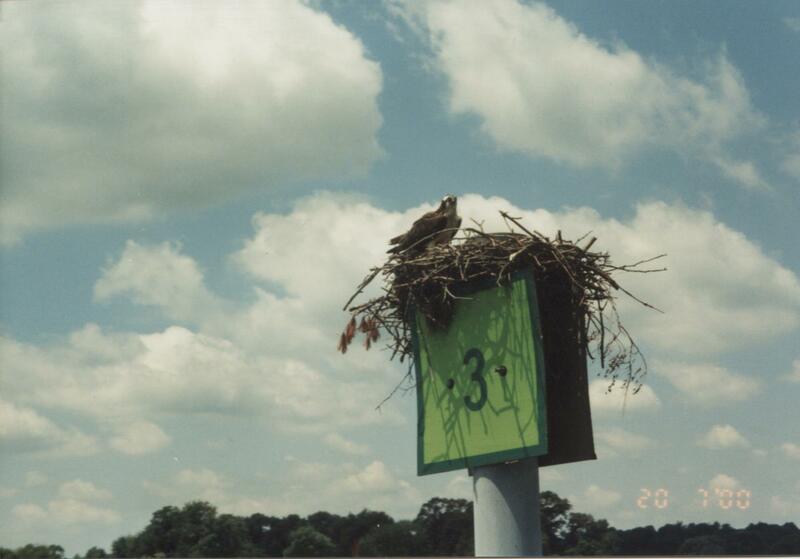 This picture was taken when we were due south of the NAS point. Really is beautiful and protected! First night anchoring out and we wanted to be safe. I dropped an anchor out a ways from the shore, went in gently bow first and when I touched bottom I jumped off the bow and buried an anchor on the shore. A little later I turned the boat around by simply tying off the rodes at opposite ends of the boat. I removed the rudder first though and was able to almost put the stern in the sand. Was just a short step off the boat to shore. Perfect!! We had lunch and then I took a walk to the east end of the island. Met our neighbors - a man and his brother-in-law were sailing the two nice vessels (I believe they were both Endeavor 34"s) at that end. They were friendly and even offered for us to join them at their campfire later that night. As the evening wore on my wife fixed stir fry for supper. Perfect one dish meal and not too difficult in the small "galley". Of course the "galley" is under my bunk. Here I'm reaching in from the cockpit for my share of the tasty dish. An exciting day came to an end. 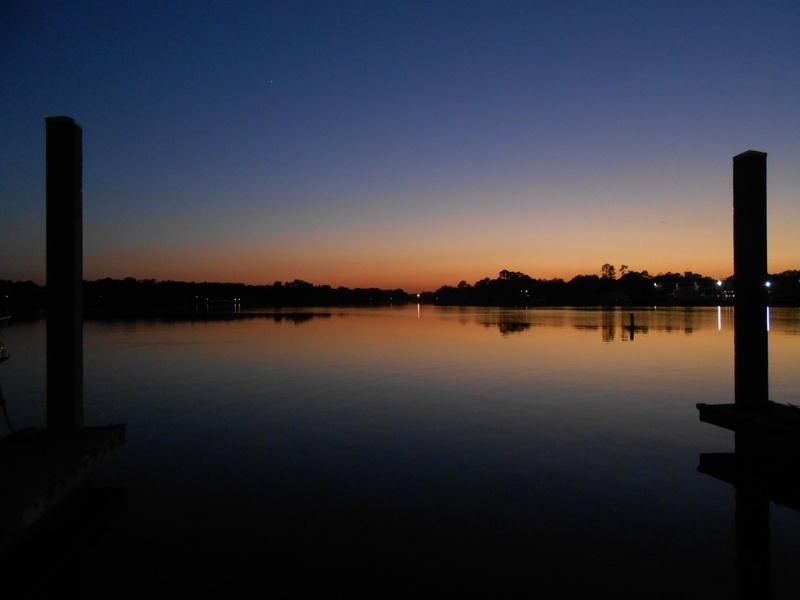 I was totally exhausted: the trip prep, journey down, two so-so nights on the boat, an anxious crossing of the bay. When it got good and dark, I zonked out! Slept like a log!! Didn't awake 'til sunrise. The day broke as beautiful as ever. I was eager to get the forecast for our trip back to PSM. I sure didn't want another experience like the day before and would do anything to avoid putting Robin through it. 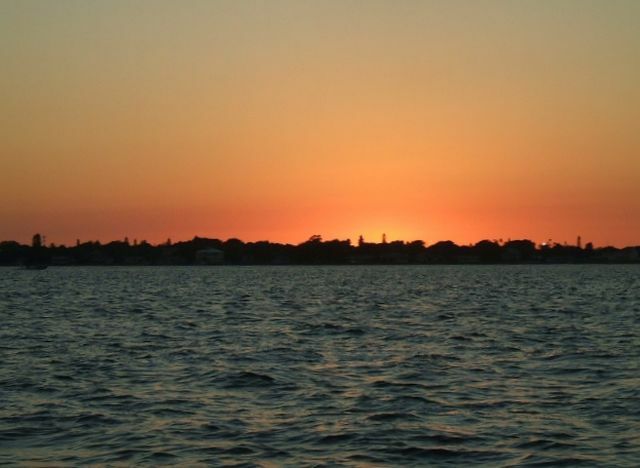 The winds were predicted to be out of the east at 11-14 with a moderate chop on the bay diminishing to 8-11 in the afternoon with a light chop. Sounded like the prefect ticket home. We figured we could spend the whole morning on the island, eat lunch and then haul anchor leaving us plenty of time to get back before dark. We did a the complete circuit around the island and thoroughly enjoyed ourselves. 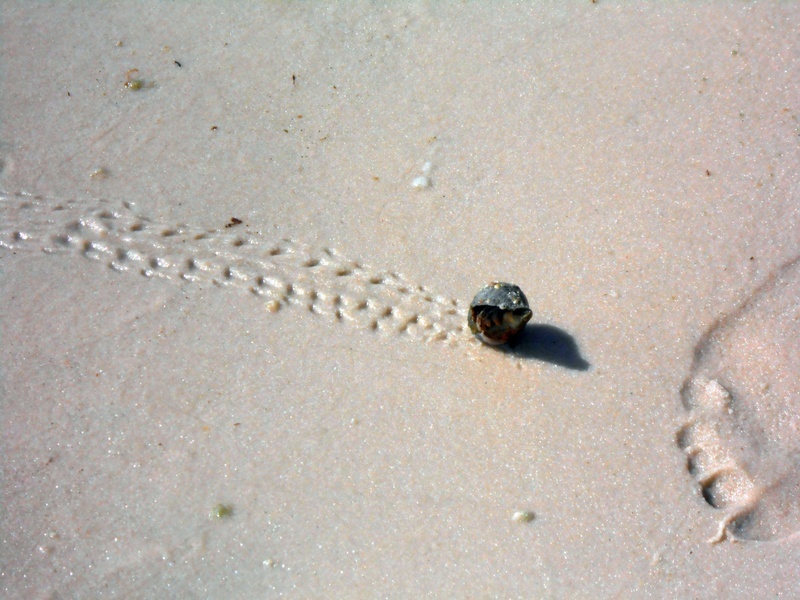 Of course, we discovered that most shells were inhabited by the hermit crabs. If we walked in the water, we had to watch where we stepped because there was no shortage of jelly fish. Upon returning we ate lunch and headed out. Again, I decided not to try the "shortcut" since it was low tide. As we rounded the backside of the island Robin spotted some dolphins playing in the shallows. It was cool seeing them especially since it was her birthday. With winds out of the east again, I had already made up my mind that I would motor out to the buoy off the point of the NAS. Motoring out at about 5 knots I was surprised that the wind in our face was no stronger than it was. 5 plus the 10 or so should have been fairly stiff but it wasn't. When we got to the buoy, I hoisted the sails. 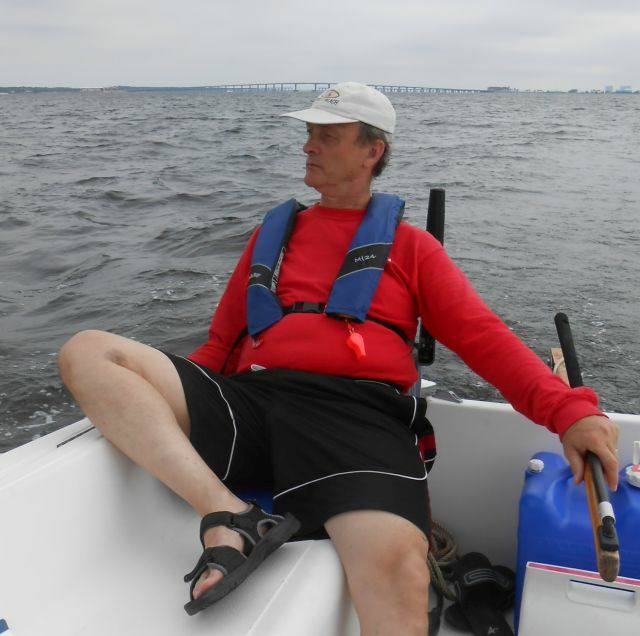 The winds were indeed lighter than predicted, but we enjoyed a leisurely sail into the bay at 2-3 knots of speed. My GPS said to head toward the white water tower so that was our mark. From the channel buoys we motored the rest of the way. The late afternoon and evening were very mild and enjoyable. I explored the docks while Robin cooked us some ham steaks in the cabin. We ate dinner on the dock. 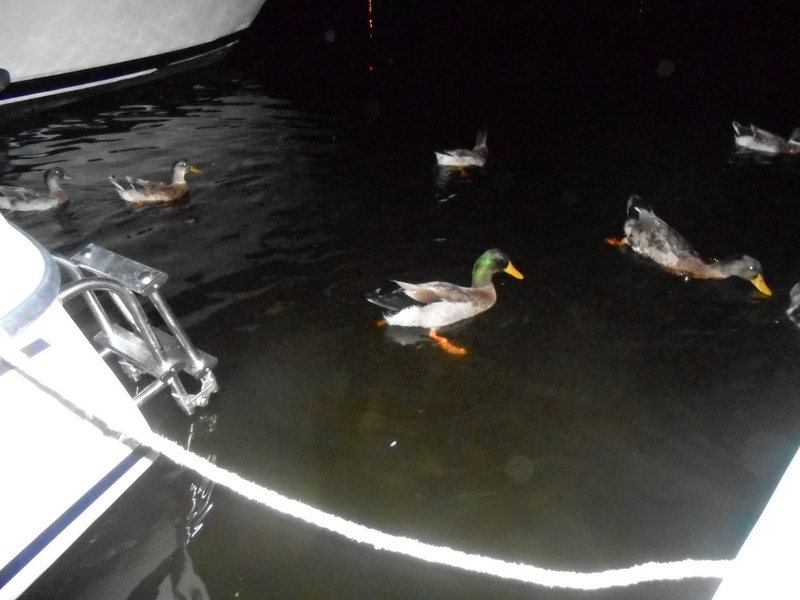 When night fell the ducks showed up. I couldn't resist so I asked for a few slices of bread. Before it was over I had 12 feathered friends and quite feisty they were too. We slept well our last night. I had a small chore when daylight came. When I launched the boat I had pulled out the tongue extension. Unfortunately, I had failed to make sure the trailer wires were free and snapped them. So I just had to splice them back together. With that done and a little breakfast, we retrieved the boat, derigged her, packed up and hit the road. It was a beautiful day for the highway and we enjoyed the scenery. We took another route home - up through Alabama. It actually is a prettier drive. We pulled into our yard at around 8 p.m. EDT. I posted this on TSBB shortly after the Tampa Bay trip. 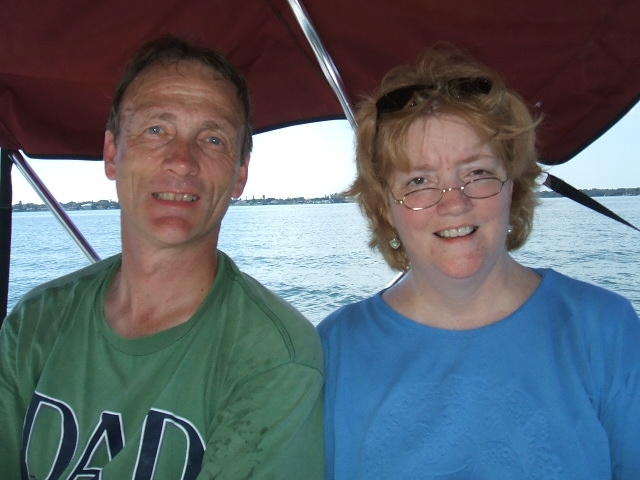 I began this website not too long ago and decided to add some accounts of past sailing experiences. In this category I will post about trips on bigger waters, "the high seas". 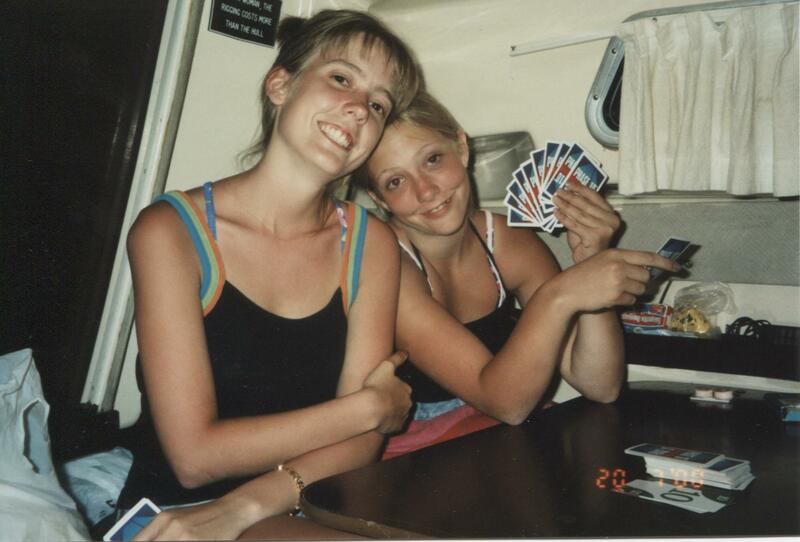 Let me set the stage here: I've been sailing since 1999. 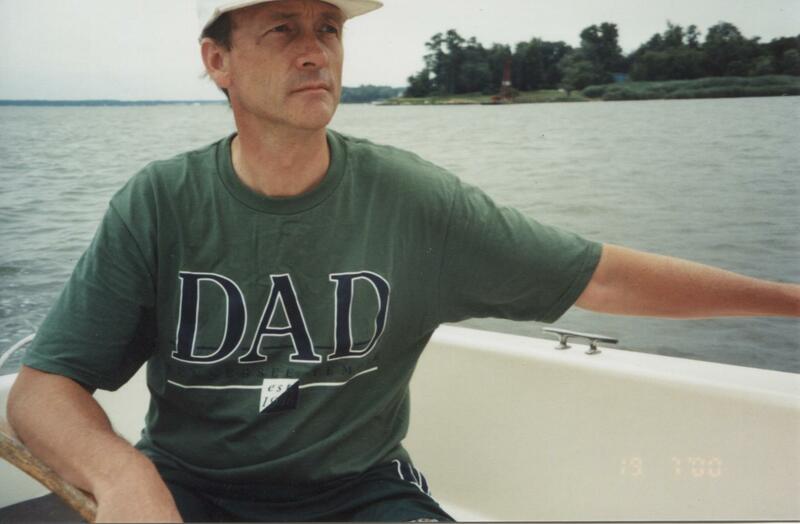 I'm a lake sailor except for one 4 day excursion on the Chesapeake Bay in 2000. That trip was not without incident. In fact, my whole sailing career is loaded with "incidents". These have left my wife less than avid about sailing. We packed the boat on Monday and had her ready to pull out at 4:00 a.m. on Tuesday morning. I would be towing with my Grand Marquis which I have always used to tow. I got to bed a little after midnight and was as anxious as a kid on Christmas Eve. As tired as I was, I had a little trouble falling asleep. The alarm went off at 3:45, and we were up and piling into the car. We pulled out about 4:20. It's about 10 miles to the interstate and that went fine. I was careful to put a good amount a weight on the tongue so it would pull well. In fact, I used a bathroom scale and had 300 lbs on the tongue. That's all I could afford since I have a class II hitch and I also had my daughter's luggage that would be going back with her when we dropped her off at the Atlanta airport on the way back. The car was low. After we hit the interstate it was not long until we all realized the car wasn't doing well. The trailer was swaying a bit, and when the big 18-whelers came by it was a bit unnerving. We drove about 10 miles and all agreed it wasn't going to work. None of us was up to 1200 miles of "white knuckles" riding on "pins and needles". We pulled off the road and assessed the situation. I was absolutely numb. All that work and now no trip. We returned home and my wife went back to bed. I laid down on the sofa to clear my head and try to come up with an alternate plan. My daughter, who was so looking forward to the trip, put her mind in gear. She finally called my other daughter and asked if we could borrow their truck. So at 8:30 we exchanged vehicles and by 10:30 (I had to rewire the plug for the trailer lights - the truck did not have a "pig tail") we were "on the road again". And, boy, what a difference with the pickup! This was going to work. It was a beautiful day to travel. Traffic moved well and we had no problems in route. We were getting a 6 hour late start though, and this impacted my planned itinerary. As we traveled, I had to rework my plan. Since I was so familiar with the area after weeks of studying charts and preparing, I was able to come up with a "plan B". 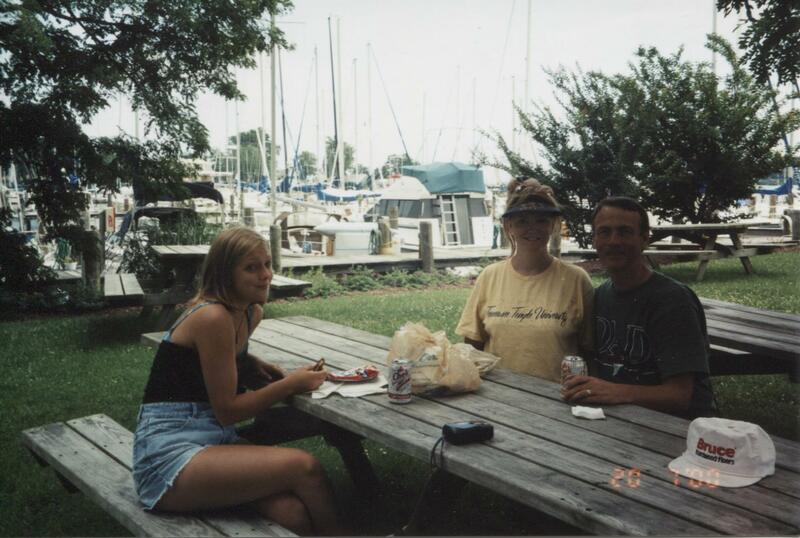 I had planned to start at the Seminole boat ramp, motor to Dunedin Marina by dark and spend the first night there. 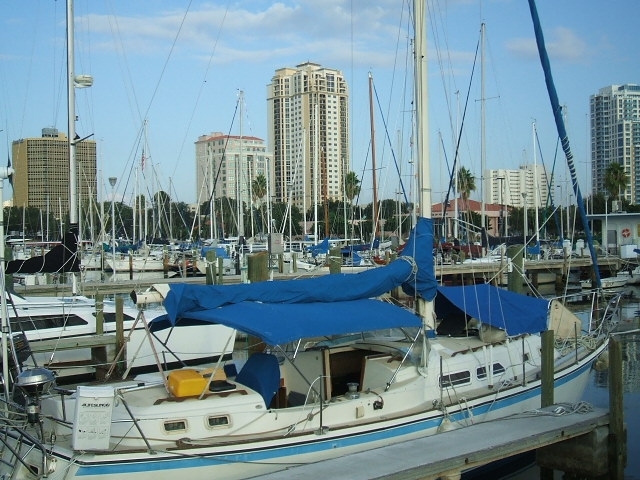 There was no way I was going to make it by dark, so I decided we'd go to St. Pete, put in at their municipal marina and stay right there. No motoring in the dark. We arrived at St. Pete about 8:30 p.m. We parked the truck in the marina and figured, since it was dark already, it wouldn't hurt to go ahead and have some supper first. 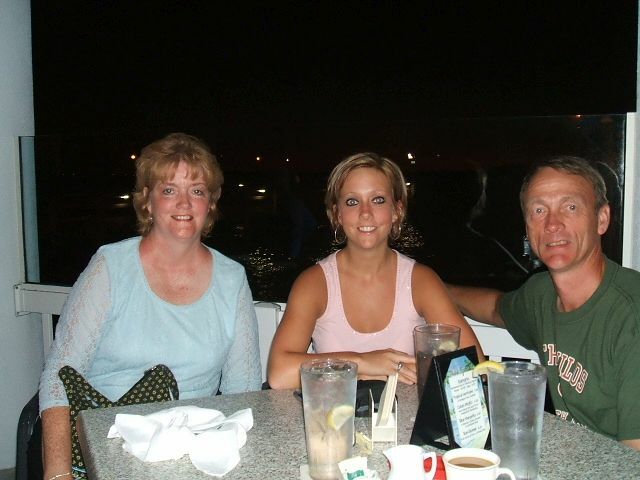 We walked to "The Pier" and had supper at Cha Cha's on the upper deck in the open air. It was wonderful: a little warm but the breeze was blowing nicely. 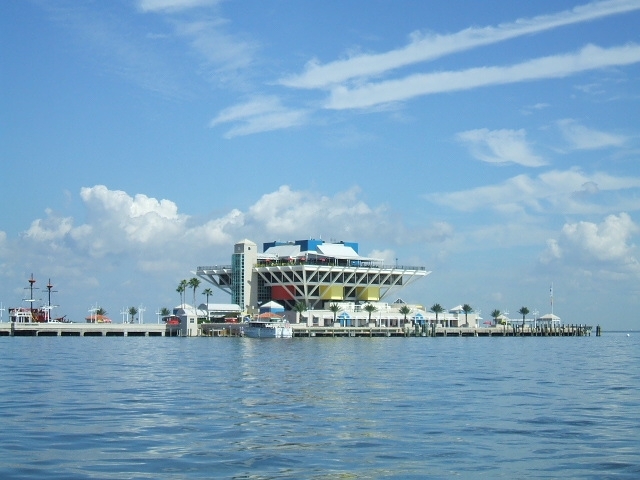 After breakfast it was back to the St. Pete marina and setup time - again. We were in the water by lunch time. We decided to motor over to the courtesy docks. I usually check my reverse gear before docking. It's not very reliable; seems to want to kill the motor. Well, it did. More frustration. I decided not to try to dock without reverse. I wasn't aware of the mid-day doldrums, but it was perfectly calm - and the day was hot. More frustration. I'd driven 600 miles to bob and bake! I can do that on my own lake. This was the breaking point for my wife. She'd been very patient, but this was about all she could take. She doesn't tolerate heat and she was ready to go back to Georgia! I just sat there like Tuesday morning wondering what in the world to do. While I pondered things, she took a dip in the "shark-infested waters": facing heat stroke or entering the food chain, she chose the later. I decided we were here, and we would make the best of it. I began to motor out to the Sunshine Skyway Bridge. Within a half hour the wind started to stir. I was encouraged. A few minutes more and I decided it was time to sail. By the time I got the sails deployed the wind was perfect. We had the most beautiful sail out to the bridge. The winds were northerly at about 10mph and we were on a beam reach doing hull speed. I was ecstatic. I was able to sail all the way out to the bridge on one tack at full speed. That just hardly ever happens on a lake. What a great sail! 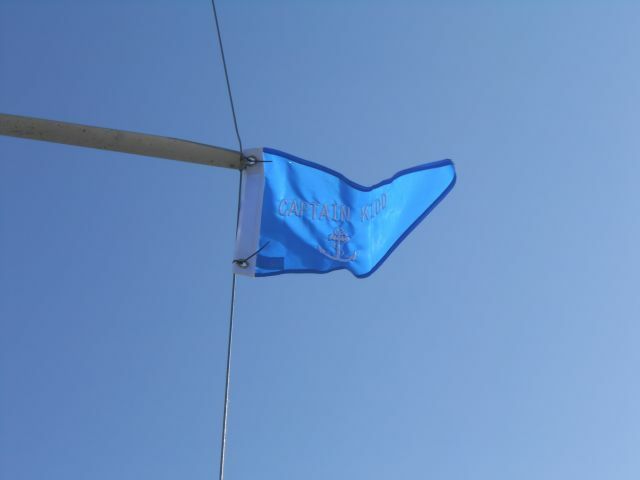 The winds built a little and I furled my headsail in a bit and was again comfortable. Waves were 1-2 feet. 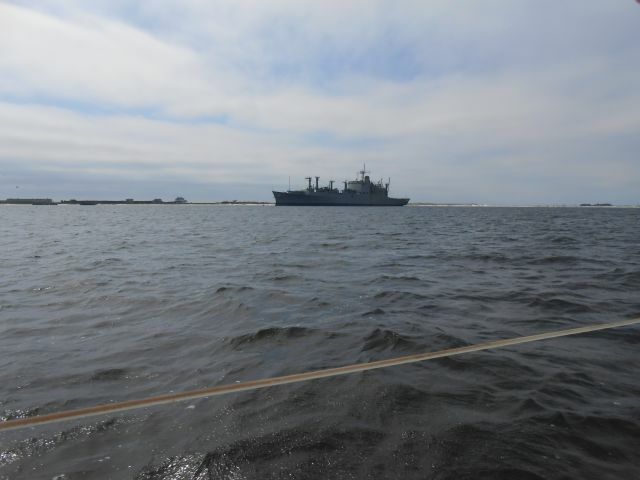 Again, a bit of a new experience for a lake sailor, but it was still pleasant for captain, mate, and crew. As we were approaching the bridge, I was doing a bit of filming. Suddenly my daughter shouted, "Did you see that?!" Apparently I had just missed getting footage of a dolphin jumping 6' out of the water silhouetted against the western sun. Tiffany loves dolphins, always has - and she was overjoyed at the spectacle. We sailed under the bridge filming as we went. It was neat. I had driven over that bridge a few years ago and had looked down on the bay thinking to myself, "That's some big water, but I sure would love to sail on it." Here I was sailing under that very bridge. As we approached the harbor and marina I hailed the dockmaster on the VHF (the very first time I ever used it! ), and we set up dockage for the night. Bill was so nice. He's a liveaboard right there at the marina. We spent a great night there and had a wonderful supper of salmon steaks, peas and carrots, garlic bread, and Zebra cakes for dessert: compliments of the chef (my wife). The shower facilities were absolutely spotless and it was nice to get cleaned up before retiring. I had asked Bill about mosquitoes. His answer, "What mosquitoes? Don't have any." He was right and the weather was so perfect that I decided to sleep in the cockpit that night. It was absolutely heavenly. Thursday dawned as pretty a morning as you could wish. We leisurely ate a breakfast of pop-tarts and then hauled the boat out. 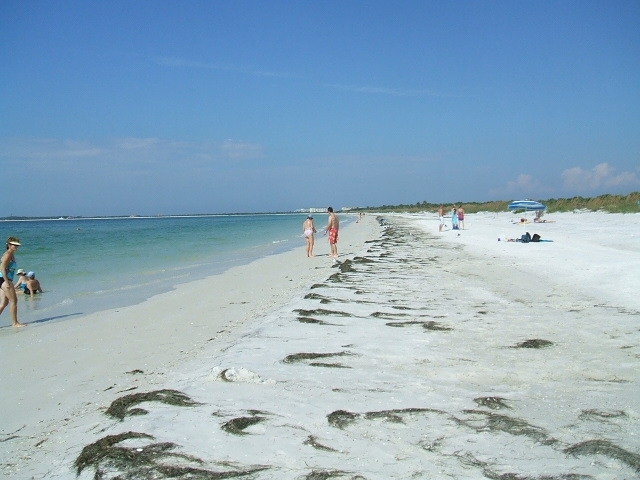 I wanted to do Caladesi Island and sail in the Gulf so trailering over to Clearwater was really the only option. 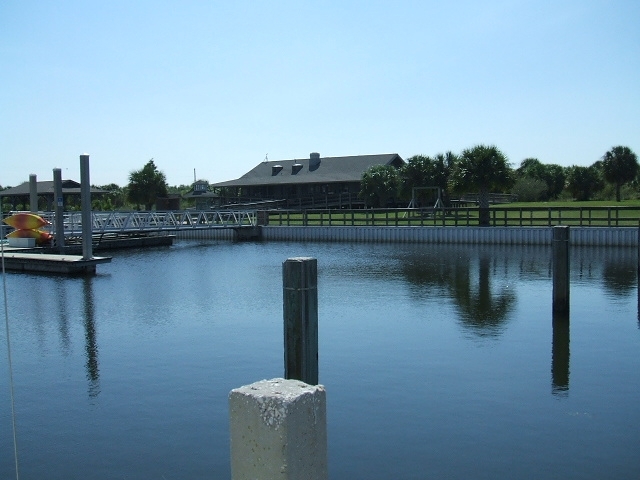 Once we trailered over to Clearwater, we launched at the Seminole boat ramp and motored out to the Caledesi eating lunch as we motored. 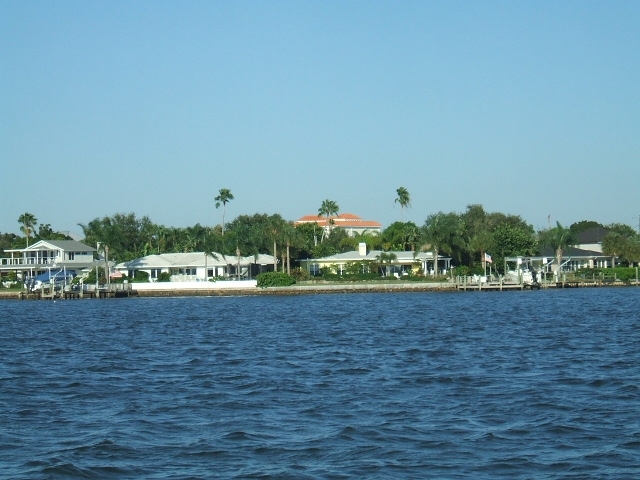 The ICW was beautiful and the homes on the waterfront gorgeous. We quickly got ready and went to the beach for the afternoon. Not many people there and after the last tourist boat left we were literally the only people on the beach as far as we could see either direction (probably 3 miles). We headed back before dark and had another great supper of ham steaks, green beans and potatoes, with Zebra cakes again for dessert. When we got our first mosquito bite the netting went up, and we saw maybe one more of the buzzing creatures the rest of the evening. 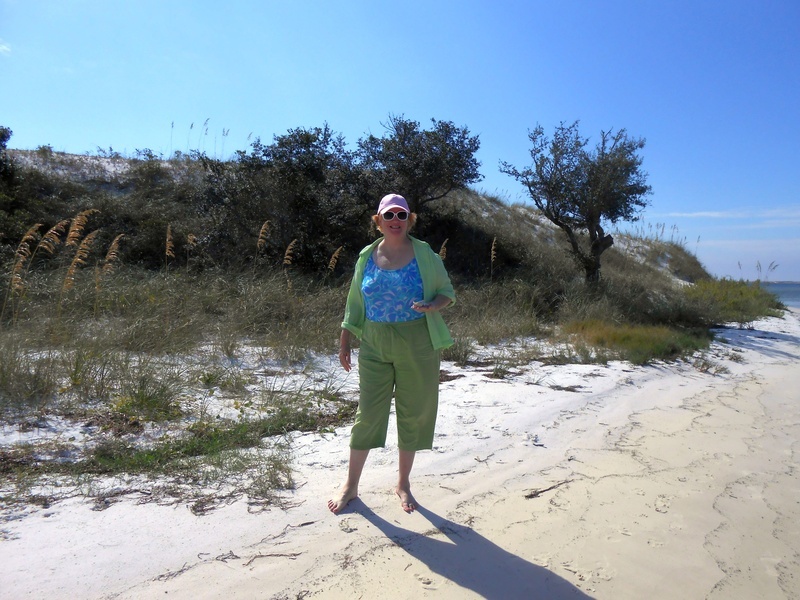 On Friday morning we did the beach walk shelling as we went. 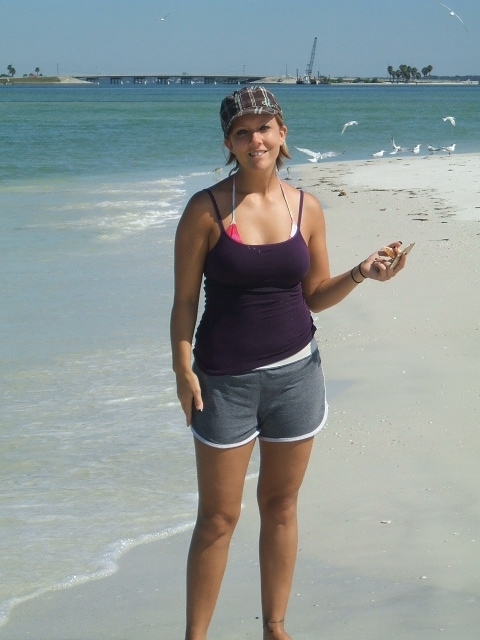 Along the way my daughter was given a tip to walk out into about 2' of water where she began to find some conches. 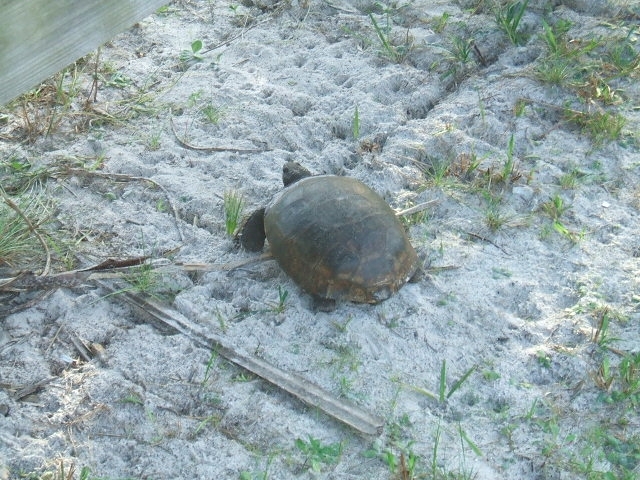 Most of them were live and had to be thrown back, but she did find a few empty shells. My wife also picked up enough shells to give out to her Sunday school kids. 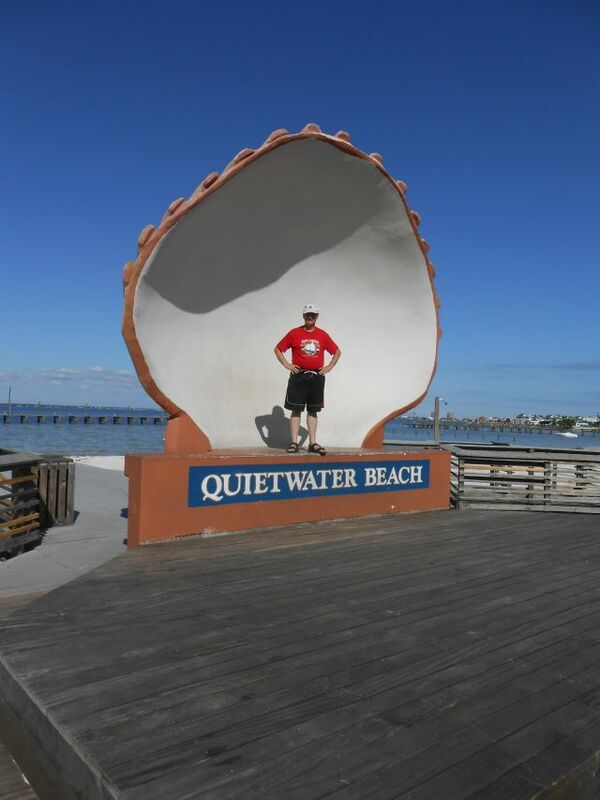 After our walk, we ate a lunch of PB&J sandwiches under one of the pavilions and set out for some really big water, the GULF! 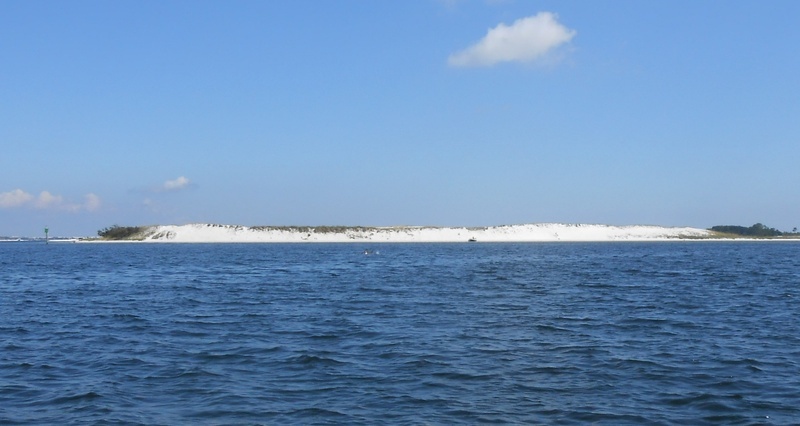 It wasn't very far to the Gulf; and, after setting the sails with the boat motoring into a 10-15mph breeze, we turned south toward Clearwater Pass, about a six mile sail. I had set the sails with a reef in the main and the headsail partially furled. I quickly let out all the sails, and we were doing nicely with following seas of 2-3'. It was quite lovely. I could have sailed wing & wing and headed straight for the pass; but, since I was in no hurry, we sailed a bit SSW on a broad reach. That put us a little further out into the Gulf, but it was a nice day and little reason for concern. The further we sailed, however, the more the wind picked up. According to the weather buoy, by the time we were ready to gibe back toward the coast, the winds had picked up to 15-16 knots steady with gusts to 18 knots (that's 17-21 mph). I estimated the waves were 4-5 feet. The girls got really nervous, especially after I executed a poor gibe and rolled the boat a bit. I really didn't want to sail through the pass, so I doused the sails and cranked up the Honda 8. She died when I put her in gear the first time; and, for a moment, I was a bit concerned myself - we were being driven by the wind toward the channel marker and beyond that was the rocky shore . She kicked in on the second try, thankfully, and we motored on into the Clearwater Pass. As it turned out, I could have easily sailed through the pass. Since the winds were out of the N, maybe a bit NNW, the pass was in the lee of the island which left the waters pretty calm. I motored under the bridge without incident, but as soon as we were out of the "shadow" of the pass, the stiff winds hit us. 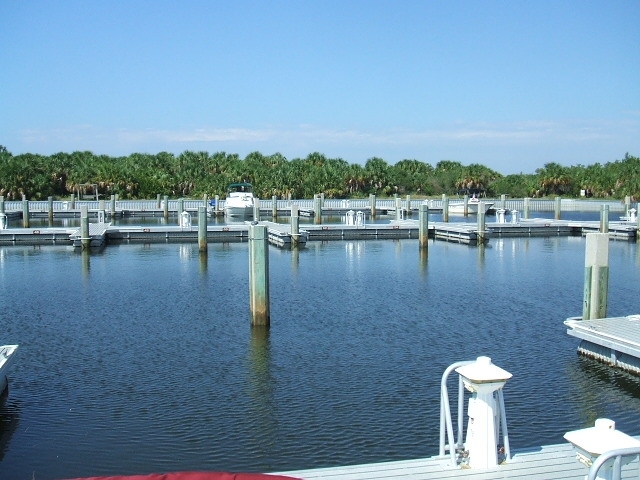 We headed north up the ICW toward the Dunedin marina, stopping at the Seminole ramp on the way for gas. Now my wife would have really killed me had I run out of gas! Truth be told, I had checked my fuel a little earlier and I was dangerously low. Man, was I glad we made it to that fuel dock! If I had run out of gas in that narrow part of the ICW, those winds would have quickly pushed us... well, let's not think about that. We ate from the light fare portion of the menu to save a few dollars and had a great supper. My daughter and I had seafood antipasto which was a variety of things including tuna, salmon, mussels etc with some special sauces. It was different, but I wanted different. It was a good choice. Robin had southern chicken salad which she loved as well. It filled her up. 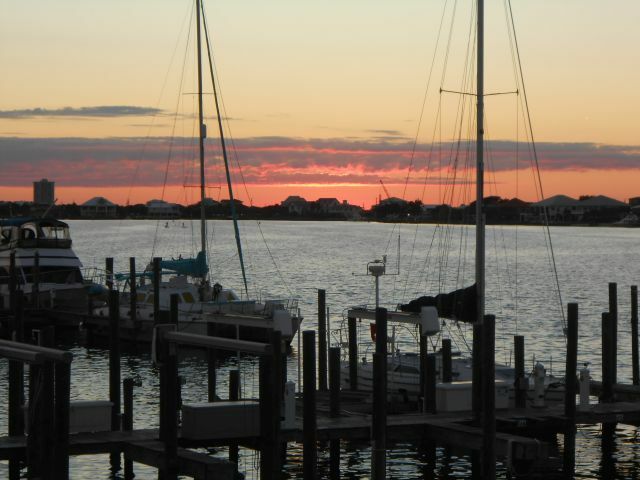 After returning to the boat, I walked around the docks for awhile particularly noticing the sailboats. 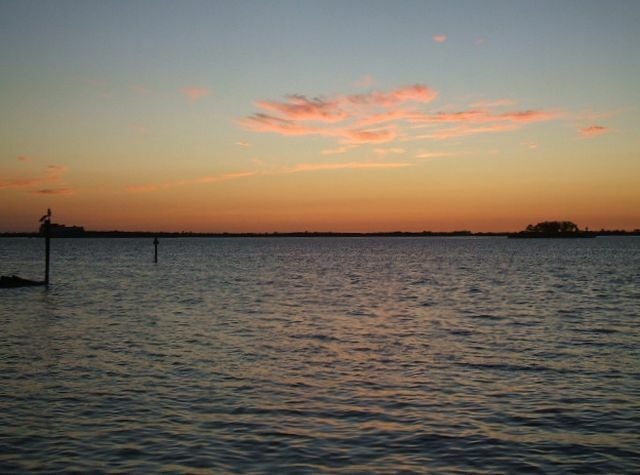 We had a restful night’s sleep, we motored back to Seminole at daybreak. We were treated to one final joy on the way to the ramp when two groups of dolphins swam by about 30 yards off our port. We turned the boat around, motored parallel to them for a bit, and got a little footage while watching them. We had a little wait at the ramp but finally got the boat hauled out. While getting the boat ready, a couple pulled in with a nice Compac 19. I introduced myself and asked if they had ever been on TSBB. He said occasionally, but it had been a while. Hope they had a good sail. We left about 10:00 a.m. and dropped Tiffany at the Atlanta airport at 6:30 p.m. I felt a little funny driving through the airport towing a sailboat. We were back in Dalton by 8:30. What a trip! What highs and lows! As I said, it really was the best of trips with a few moments of utter frustration thrown in to keep us humble I guess. One thing's for sure: we made some memories!